Great hotels constantly improve. That is why I was not surprised to find that the appearance of the splendid entrance hall of the magical Chateau de la Messardière had changed. Now its colours are gentler. I very much like its new and sophisticated tones of blue and grey. Only a handful of hotels in France are officially designated ‘palaces’, and the Messardière is of that number. 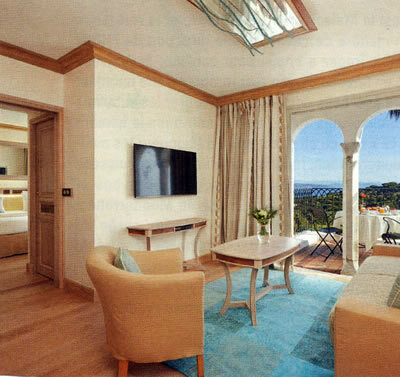 It is not just one of the best hotels on the French Riviera: it is one of the best hotels in Europe. 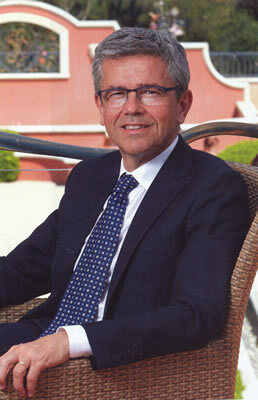 And much of the credit for this exalted position must go to the hotel’s Director General, Alexandre Durand-Viel (pictured). He has taken this sparkling jewel in the treasure chest of French hospitality and has polished it until it sparkles like the brightest diamond. Monsieur Durand-Viel is a remarkable hotel manager. He is also a civilised and cultivated gentleman, being not only the President of the SociétéTropézienne des Amis de la Musique but also the instigator of the Messardière Prize for Summer Novels. The keep of the castle was built in the Nineteenth Century in the Gothic manner by the Comte de la Messardière. (The family’s association with the building continues, for his great grand-daughter, Victoire, is a talented artist and many of her paintings adorn the rooms and corridors of the hotel.) Around this central block are modern structures, designed to remind us of the Italian Renaissance – with their columns (both Florentine and Genoese) and their Venetian arches. This meeting of styles is successful, as you can see from the pictures. Indeed, whenever I turn off the route Tahiti and guide the motor between the wrought iron gates and up the drive through the 25 acres of gardens, I always feel I am purring up the incline towards a place of real welcome. Above the entrance is a crest with the family motto, Victor et Inermis, which we may translate as ‘Victor even when disarmed’. It is appropriate, for the victory here is, indeed, won without force of arms. It is a victory of good hotel-keeping, and it is achievedby the powerful combination of a beautiful setting, exquisitely tended gardens, luxurious accommodation furnished in impeccable taste, wonderful food and a body of staff (in high season it can number as many as 180) which is totally dedicated to serving those fortunate enough to occupy the 118 rooms and suites. My own room, number 237, was a Junior Suite, and therefore 850€ – 1,540€ a night, bed and breakfast for two, according to season. It was reached by a corridor decorated with posters of the films of Brigitte Bardot – so that, by the end of my residence, I was quite familiar with at least the titles of Miss Bardot’s œuvre. Within, my apartment was light, spacious and supremely comfortable. 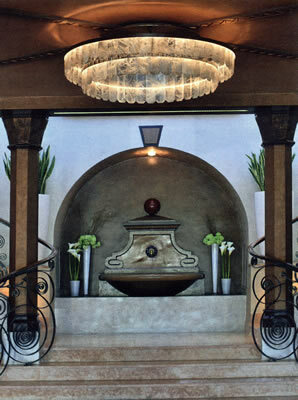 Its colours of white and pale lemon were restful, and its floors of ceramic tiles entirely right. A sliding door from the hallway opened onto the bathroom, wherein I found two wash basins, a tub of good size, a separate shower, a separate loo, spotlights, a shaving mirror, toiletries by Cinq Mõdes and by Blaise Mautin of Paris and that simple device which always indicates to me that the details have not been overlooked – an extendable washing-line over the bath. In the bedroom the bed had been made wonderfully soft for me. The lighting – from five table lamps – was effective. There was plenty of space for a sofa, an armchair and a writing desk, and the television had a dvd player attached, so that the songs of Cole Porter could accompany my afternoon doze. A dressing room with a safe was a welcome convenience. And then there was my terrace. Through the French window of plate glass was a platform large enough for tables and chairs, from which I could look towards the distant bay and the azure sea. This accommodation was entirely to my liking, and enabled me to dress well for the evenings. I like to look my best for dinner – particularly when the restaurant is as chic and as sophisticated as L’Acacia at the Château de la Messardière, with its Bernardaud crockery, Degrenne glassware, white napery, Chrisofle cutlery and waiters in black waistcoats lifting silver domes. The cuisine of Executive Chef Bilal Amrani (pictured) is appealing, for his ingredients are of the finest, his combinations of tastes and textures are well-judged and his culinary skill is impressive. 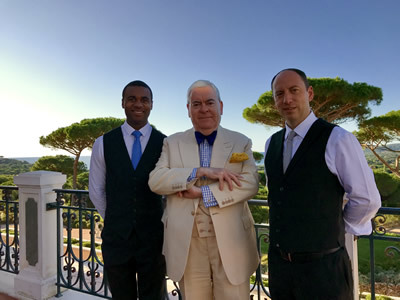 You will enjoy eating here, as I did – which is why I was keen to be photographed with both the Food & Beverage Manager, Arnaud André (on the right of the picture) and the Restaurant Manager, David Polomat (on the left). 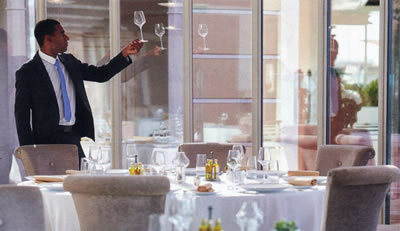 Chef Amrani offers two set meals, priced at 80€ and 120€. I chose three courses from the carte (for which you should allow 110€-120€). My beginning was a luscious and delicate confection of Ratte potato, almonds, egg, croutons, bacon, foie gras and truffle. Of course, the bacon took over – as it always does – but this was still a very enjoyable opening course. Then I tucked into some exceptionally tasty fillet of beef, sautéed and served with fried vegetables and basil gravy. And more basil came with my pudding of wild strawberries, with meringue and sorbet. The wine list has 367 offerings, including 14 magnums and 19 halves. All, apart from six, are French. Prices run from 45€ for a Provençal white (Cassis) to 4,930€ for the 1986 vintage of Pétrus. Other top class clarets also appear, with 1996 Latour (2,200€), 1979 Lafite (2,900€) and 1986 Haut Brion (1,760€). 2006 Dom Pérignon champagne is 480€ and 2013 Montrachet, Henri Boillot, is 1,730€. My own drinking included a lovely red Côtes de Provence, made from cabernet and syrah, which was full-bodied and packed with ripe fruit and intriguing hints of spice (Ch. Roubine, “Cuvée Inspiré”, 2014 – 80€). This fine wine was made by a lady winemaker and was recommended by the lady sommelière, Charlotte Hellec. Well done the ladies! – as I hope we are still allowed to say. I must make mention of my breakfasts (on the restaurant terrace, with its gorgeous view) for two reasons. First, the food - both from the buffet (orange juice, croissants, ham, cheese, cakes and brioche) and from the kitchen (onion omelettes, sautéed mushrooms and grilled tomatoes) – was truly excellent. 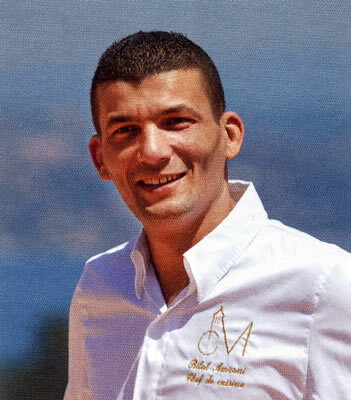 And second, there was the afore-mentioned Food & Beverage Manager, Arnaud André. He worked tirelessly to ensure the comfort of his guests, and managed – by moving the sunshades this way and that – to avoid any ray of sunshine falling upon my sensitive skin. Such care for my well-being is what I would expect of a great hotel. And that is what the Château de la Messardière is: a great hotel. And great hotels constantly improve. Route Tahiti, Saint Tropez 83990, France.